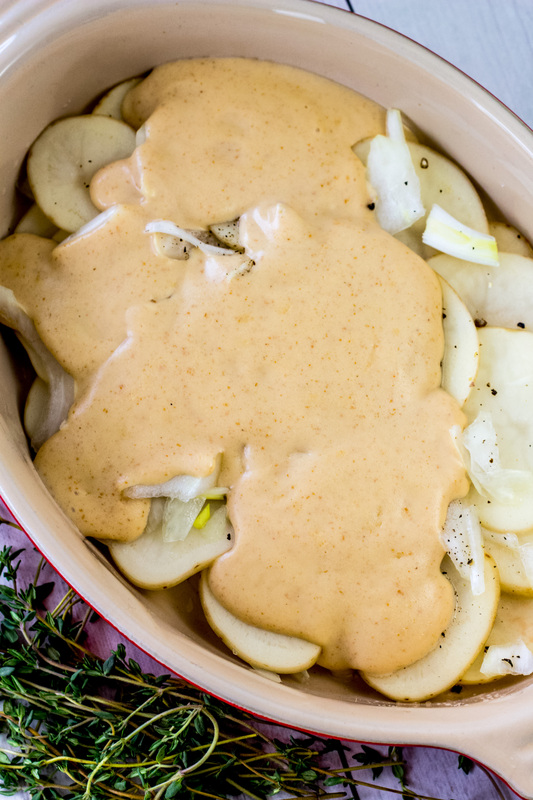 Vegan Scalloped Potatoes made with a creamy, cheesy, and rich Béchamel Sauce. The onions caramelize while baking and the top of the casserole becomes perfectly crispy. A family favorite holiday side! This trip is particularly special because we are doing some serious wedding planning. J and I decided on July 2018 for our wedding in Bruges, Belgium. We’ll be meeting our officiant and seeing our wedding venue while we are here. Did I mention we are planning a 100% vegan wedding? More on our Big Fat Belgian Vegan Wedding to come! But first, let’s discuss these Vegan Scalloped Potatoes. 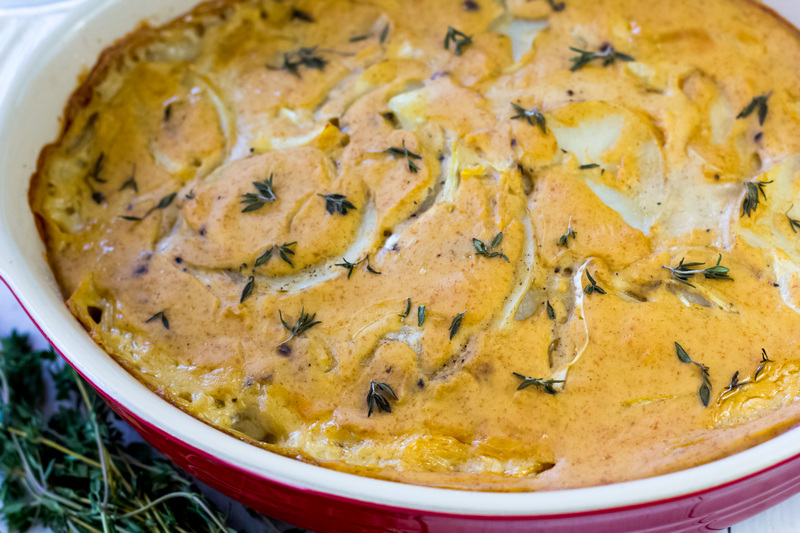 Scalloped potatoes are a must for my family at Easter dinner. 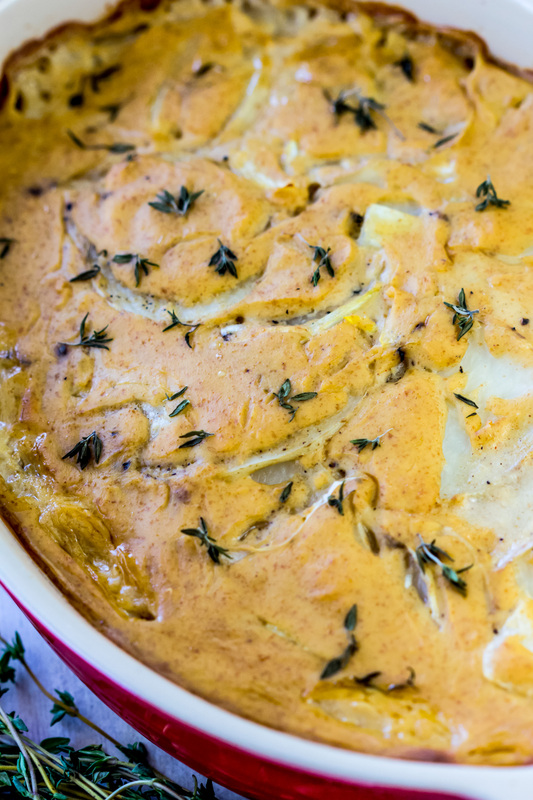 I have a few tricks for the perfect vegan scalloped potatoes every single time. Mandolin: Use a mandolin to slice the potatoes. The worst part of making scalloped potatoes growing up was cutting a million potatoes. 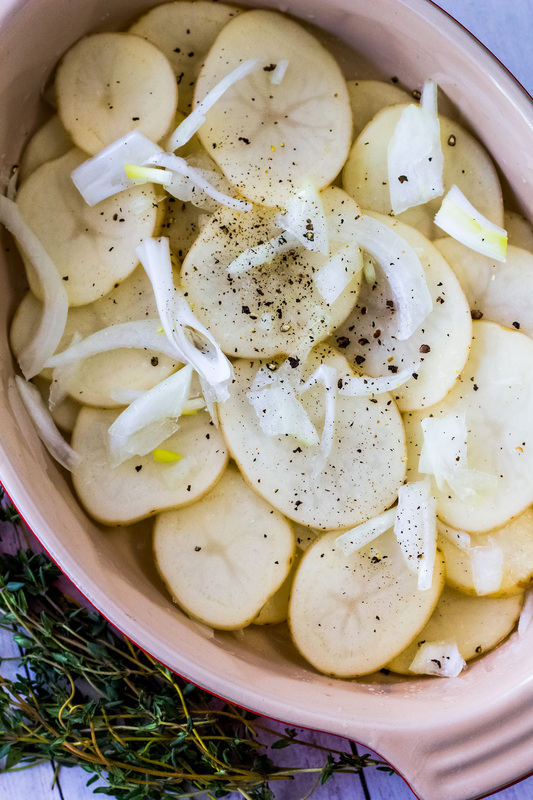 With a mandolin, you can cut all the potatoes you need for this recipe in EQUALLY thick slices in only 6 minutes flat. Onions: I add onions in between each layer of potatoes. I also use a mandolin to slice the onions into super thin slices. The onions caramelize in the oven and combine perfectly with the Vegan Béchamel Sauce. Layer the Béchamel sauce in between every two layers of the potatoes and give the casserole a dish a good shake at the end. This helps the sauce to get in between ALL the potatoes. Perfect potatoey, creamy goodness. YUM! If you make these Vegan Scalloped Potatoes at home, snap a photo and tag me #CearasKitchen on Instagram. 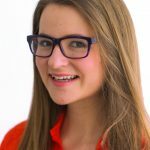 Seeing your delicious recipe recreations makes my day! Soak the cashews in boiling water for 30 minutes or overnight in the fridge. You can skip this step if you are using a high speed blender. Preheat oven to 400F. Lightly oil a casserole dish or line with parchment paper. 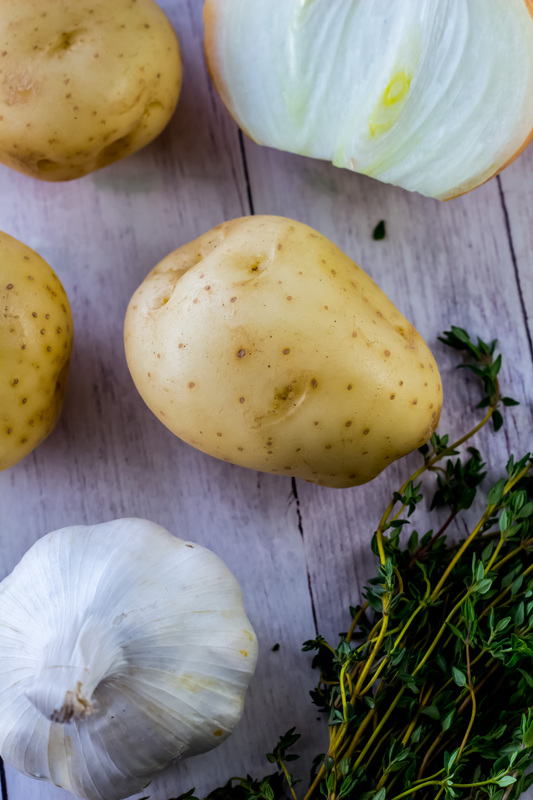 Scrub the potatoes and remove any dark brown spots. Thinly slice the onion and potatoes (the best and quickest way to do this is with a mandolin). Set them aside in separate bowls while you prepare the sauce. Rinse the cashews. Add the cashews, garlic, bouillon, soy milk, water, vinegar, paprika, and nutmeg to a blender. Blend until creamy smooth. Add the nutritional yeast and flour. Pulse blend until combined. Warm the sauce over medium-high heat in a deep pan. Whisk until the sauce thickens. This will take about 4 to 5 minutes. Alternatively, you can thicken the sauce in one minute intervals in the microwave until thick. Layer flat the potatoes in the casserole dish. Add the onions with a pinch of salt and pepper. Repeat for the second layer. Pour 1/3 of the sauce onto the potatoes (see photo for reference). Repeat the previous step one or two more times (this will depend on the size of your casserole dish). Make sure to the pour sauce in between every two layers. In my casserole dish, I have 4 layers in total. Pour the rest of the sauce on top. Carefully shake the casserole dish so the sauce gets in between all the potatoes. Garnish with fresh thyme. Bake for 45 to 50 minutes until golden brown, the sauce is bubbling at the sides, and the potatoes are fully cooked through. Serve warm with your holiday meal! Enjoy! 1) Use gluten free flour to make his recipe gluten free. [br]2) The nutritional yeast adds extra cheesiness to this recipe. You can make this recipe either with or without the nutritional yeast. [br]3) Use parchment paper to line your casserole dish to keep this recipe oil-free. Could I use another non-dairy milk like almond or coconut in place of the soy? What could I use as a replacement for the bouillon cube? I made these yesterday for our Easter dinner. They were so easy and so delicious. I have made vegan scalloped potatoes before but always used margarines. I loved that I could use cashews and not have to use oil or margarine. We had 4 omnivores and 2 Plant Based eaters at our table and everyone ate these potatoes including my teenage boys. Unfortunately there are no leftover. The dish was scraped clean! This recipe will now be my go to when I am making scalloped potatoes. Also I usually use my food processor to slice potatoes for a dish like this but I loved using my mandolin and that I was able to get bigger potato slices than with my food processor. Thanks for a great recipe! Thank you SO much for your lovely feedback, Heather! I am so glad that you and your family loved the Scalloped Potatoes! It’s always a good sign when the dish is scraped clean! If I can’t or don’t want to use the Better than Bouillon, could I use a regular bouillon cube or powder instead? The BTB base has oil in it, and would prefer to avoid. Thanks! I don’t do oil either and have had luck using Seitenbacher Vegetarian Vegetable Broth and Seasoning (found on Amazon) in place of bullion. I do find it somewhat less flavorful than regular bullion so I use a heaping tablespoon per 8 oz. of water (as opposed to the directions that call for a teaspoon). I hope that helps! 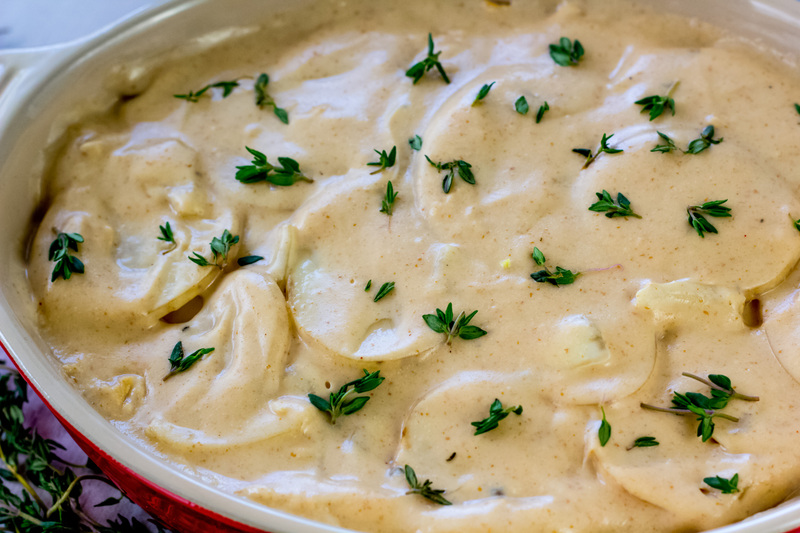 That is a very smart way of making creamy scalloped potatoes!